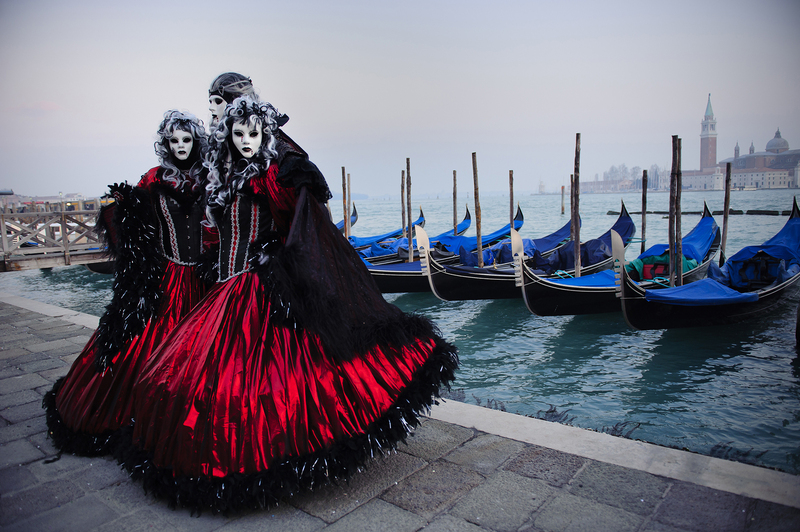 Carnevale in Venice isn’t so much a fixed event as it is an electrifying escape route to a time and world far away. During the days preceding Lent, the narrow streets of mist-veiled Venice (Venezia) teem with celebrants in opera-quality costumes. Glittering confetti reflects the passions of these surreal time travelers, who dance through the city’s ancient pathways and ballrooms. The Carnevale dream world recalls centuries of Venetian glory, especially the period from the Renaissance through the mid-1700s. The former city-state’s Byzantine, Gothic, and Renaissance structures present a spectacular backdrop for street entertainers popular in bygone times – fire-eaters, musicians, mimes, dancers, stilt-walkers, magicians, singers, acrobats, and heckler poets. Concerts, theatrical productions, and operas are scheduled throughout town. Piazza San Marco, perhaps Europe’s most famed plaza, pulses with a giddy crowd fueled by espresso, grappa, prosecco, and wild imagination. Even the damp, cold weather contributes to the magical ambiance. When elaborately (and expensively) costumed partyers aren’t wandering like antique envoys through fog and moonlight, they’re attending lavish balls in renovated palaces, dancing the minuet, polonaise, and other classical steps. Don’t fret if you can’t minuet or if you thought polonaise was a sauce – most balls also include modern moves and music. It’s possible that in another galaxy far away there’s a place as enchanting as Venice, but you’re not likely to see it in your lifetime. Canals carve this unique city into a puzzle built atop more than 100 miniature islands. The soothing sound of water lapping against quays and buildings permeates the Venetian air. In the absence of automobiles, canals function as thoroughfares navigated by private boats, water taxis, and public ferries. Tourism tops the list of industries in this unique city, and its high-end hotels push grace and luxury – along with your credit card – to the limit. Known to Italians as La Serenissima (the most serene), Venice holds some of Europe’s finest treasures in its museums and churches. But more importantly, the city itself is a spell bounding work of art made almost unimaginably exquisite during Carnevale.